If you&nbsp;have trouble viewing this email, read the online version. 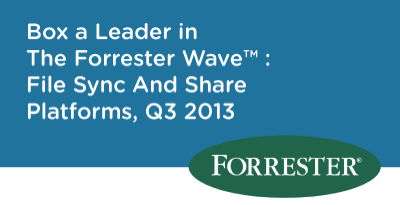 We’re very excited to announce that Box has been named a Leader in The Forrester Wave: File Sync and Share Platforms Q3 2013. File Sync and Share has become a must-have capability to enable mobile document access and collaboration, and IT teams are turning to more secure, scalable and enterprise-ready solutions like Box. Don’t miss out on BoxWorks 2013! Register today. Malcolm Gladwell, Nicholas Carr, Geoffrey Moore – that’s just a sampling of what BoxWorks 2013 has to offer. Register today and be one of the lucky few to find out what happens when there is no end to possible. Want to move lots of content to the cloud in a few seconds? We recently added the ability for users to drag and drop entire folders when accessing Box on Chrome for easy and fast uploading – with no need to click the upload button within Box. DocuSign recently updated our Box integration, making it quick and easy to access your content where you need it. When working in DocuSign, you can now select the documents you need from Box, prepare them in just a few clicks, and then automatically save the signed copy back to Box. Watch how Dos Toros Taqueria in NYC uses Box. Their story is a fascinating example of how small businesses in one of New York’s most competitive and traditionally low-tech industries are using Box to increase efficiency and scale up operations. Box Business scales from teams to large corporations, offering secure sharing through password protected links, granular permissions and access controls. Learn more or get Box Business today. I love the look, the ease-of-use, organizational function, sharing and email features. I love the ability to save bookmarks as if it’s a document. The greatest feature is Box Edit. What would I do without it — it’s what separates Box from Drive, Evernote, Dropbox, etc. – Kezia C.
Box Sync for Windows and Mac keeps files in sync between your computer and Box so you can access them from anywhere, on all of your devices. Atooma automates your Android. With Atooma + Box you can create productive rules for saving and sharing content to and from your Box account. UX Write brings an unrivaled feature set and usability experience for working with your documents on iOS. Sync your existing files with Box, or create documents within UX Write directly from the Box environment.